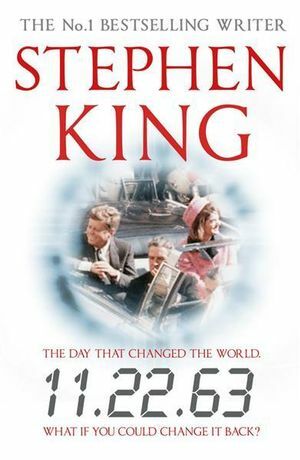 11.22.63 is a novel about a man going back in time to try to prevent the assassination of a president, in the hope that it will alter the future of America (and the world) for the better. I finished reading it the day Donald Trump was elected, which put a rather different slant on the whole thing. I can't help wondering if in 50 years' time someone will be writing a similar book in which the protagonist tries to cause, rather than prevent, a president's murder. Anyway. 11.22.63 is Stephen King's story of Jake Epping, who is shown a portal from the present day into 1958 by Al, the owner of his local diner. Al has discovered that he can stay in the past for as long as he likes, but that only two minutes will have passed in the present when returns - and that each he does return, the past 'resets' itself and his previous actions are undone. Al, now terminally ill with lung cancer, has devoted years of his life to studying the assassination of John F Kennedy and the life of Lee Harvey Oswald, in the desperate hope that he might be able to prevent it. When he realises he's close to death, he passes his secret to Jake and asks him to make one last attempt to keep JFK alive. 11.22.63 has a lot of features you might recognise from Stephen King's other work. The narrator, Jake Epping, is technically a schoolteacher but like many of King's characters is also a writer. Nostalgia and vintage Americana are a huge part of this novel, and King also continues to be fascinated with the particular character of places and their influence on their inhabitants. Derry, the former industrial town stalked by Pennywise the Clown in It, makes an appearance, along with a few of the characters from that novel, and Jodie, Texas, where Jake makes his home for part of his stay in the past, is the sort of perfect, archetypal American small town that no longer exists (Bill Bryson, in his book The Lost Continent, talks of his search for such a town, which he christens Amalgam, on his travels through the US). However, because the novel's plot requires Epping to prevent Kennedy's assassination, the real-life towns of Dallas and Fort Worth also make an appearance, neither of which, it has to be said, come out of the story particularly well. Dallas, King feels, is subject to the same dark undercurrent of evil as the fictional Derry, inhabited by inexplicably suspicious, unfriendly people and plagued by violent crime. While 11.22.63 is a long way from being a horror novel, it is often dark, and there is an odd sense of menace that hangs over things, even when Jake is living in his beloved Jodie and has fallen in love with high school librarian Sadie Dunhill. When Jake meets the mysterious 'yellow card man', a vagrant who accosts him on each of his visits to the past, it's clear that there is some supernatural significance to his presence. However, I think it's this element of the book that's the least successful. The mystery of the 'yellow card man' and the 'harmonising' of the past, which means Jake frequently experiences mirroring or coincidences throughout his time there, feels like an afterthought. I don't think it's necessary, and although it lends a sinister edge at times, it's resolved fairly hastily and anticlimactically towards the end of the book. The last few chapters of the book are quite predictable - at least, they are if you've read fair few time-travel stories before. There's no denying that this is a very long novel at close to 750 pages. Does it really need to be that long? Probably not: I personally really enjoyed the lengthy digressions, the numerous subplots and the seemingly endless detail, as for me they made the setting and the era feel so real (King's evocation of America in the late 50s and early 60s is extremely skillful and one of the book's biggest pleasures) but I do think King could have told this story in a novel two-thirds this size. Bear in mind that when Jake enters the past, it's always in 1958. At this point Lee Harvey Oswald wasn't even living in the US, let alone Texas, so there's a whole lot of other material to get through before the actual assassination storyline really kicks in - most of the book, in fact, is not really about the Kennedy assassination at all. Even when Oswald does return from his sojourn in Russia Jake has to spend many months effectively stalking him to establish that the conspiracy theories aren't true and that Oswald really was/will be the one to shoot Kennedy on the fateful day. Again, I had no problem with any of this and enjoyed every page - but I know some people will, and not unreasonably. If you like your thrillers short and snappy, then, this might not be for you, but it is a deeply immersive and impeccably-researched novel, with well-drawn characters (Oswald and his wife Marina, in fact, are among the most vividly portrayed). A big thank you to my lovely mother-in-law who read this book before I did, correctly guessed I would like it, and bought it for me for my birthday back in February. Sorry it's taken me so long to find the right time to get stuck into it!